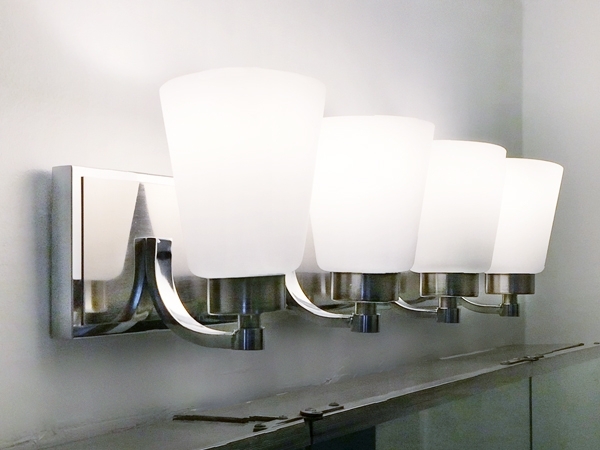 Home » Projects » Bathroom Lighting » Bathroom Vanity Light Fixtures…Up or Down!? 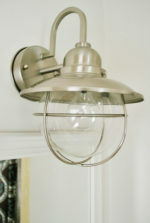 It all began, wrote Laura and John of www.rathersquare.com, with the need to update the light fixture in the master bathroom on their 92 year old Foursquare house in Chicago Illinois. 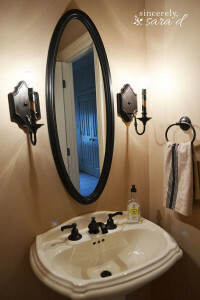 When they bought their home the original bathroom lighting looked like it belonged in a doctor’s examining room, or a hospital emergency room rather than a home! It was a solid, boxy fixture with no character and which bathed the entire room in a dingy yellow light. Wherein removing the old fixture (wide and long) revealed not only a need to resurface the wall before the installation of the new light, in preparation for the new, narrower fixture, but to also relocate the required junction box. This original post shows step-by-step (with accompanying photos) what this phase of the project involved; i.e., briefly: re-plastering, replacing lath, rewiring, texturing and painting. The wall also tested positive for lead paint content which had to be covered over by plaster and modern lead-free paint for health and safety reasons (and by law). 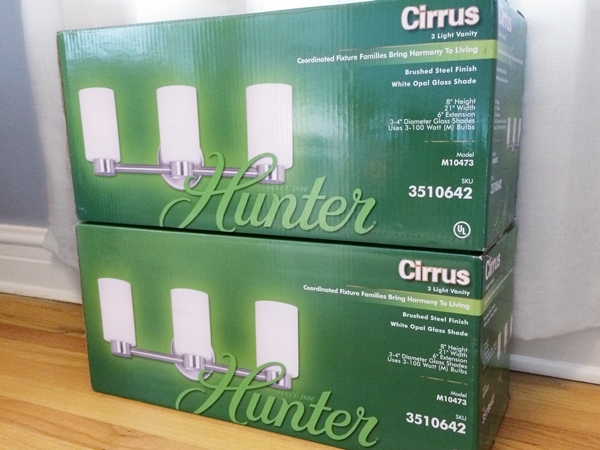 Once this extensive preliminary work was out of the way, the installation of the new light fixture could finally begin. The installation itself turned out to be a snap, and was accomplished quickly and efficiently. Laura goes into some detail on the choice of the new fixture. They wanted something that had character, wasn’t too industrial or utilitarian and which introduced clean, bright light into the master bath. They decided on a four bulb fixture with frosted shades. And here they literally turned the project on its head. Rather than install the fixture with the lights and shades pointing down as it was designed (and illustrated on the box!) Laura and John got the inspired idea to install it upside down! Sounds crazy perhaps, but it made perfect sense. 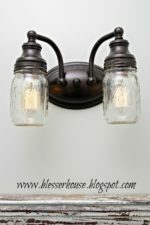 With the bulbs and shades pointing up, the light created bounced off the ceiling to illuminate the entire room, rather than spotlighting the mirrored surface of their medicine cabinet. The original design had also included pendulous knobs on top (now bottom) of the shades which would have bumped into the aforementioned cabinet; these they simply left off, the screw holes for their attachment well hidden from sight. The new fixture uses 60 watt equivalent LED bulbs, which means instant on, exceptionally long life and a whiter and brighter type of light that the frosted shades help to diffuse beautifully. The overall effect is modern without being too trendy; featuring with clean lines and no medical exam room ambiance! 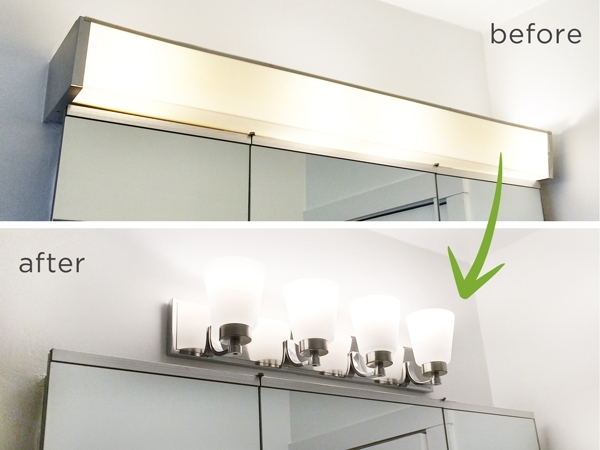 You just might be inspired to install some fixture in your home upside-down too! 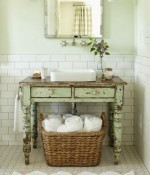 Click here for further bathroom remodeling ideas.